I am pleased to report that this was a terrific year for the JAPCC and for Joint Air and Space Power. The orga­nization published numerous studies that included action­able solutions for senior leaders within NATO. The precise application of combat power from the air has remained of the utmost importance to NATO since its inception, as evinced by a progressive increase in ­NATO’s use of Joint Air Power since the end of The Cold War. In 2014, the JAPCC has been active across the spectrum of Joint Air by providing multiple studies, leading the update of several NATO publi­cations, providing leadership in key NATO working groups, and supporting NATO Command Structure education and training events. 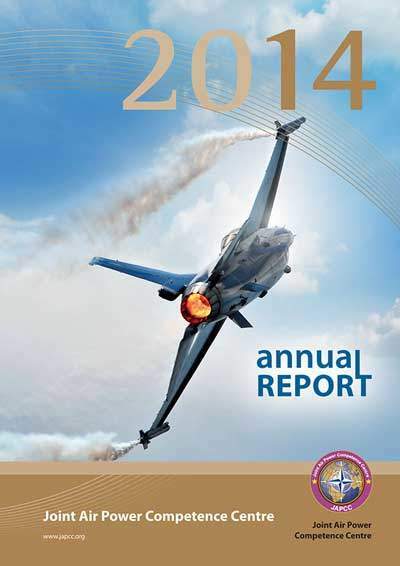 In this Annual Report, you will find information on major JAPCC studies published on Air-to-Air Refuelling, Remotely Piloted Vehicles in Contested Environments, Joint Personnel Recovery, Enhancing support to Air Advisory Activities, the Single European Skies Project and, perhaps most significantly, on the Future Vector of Air Power in NATO. This last study was the result of an 18-month-long project that culminated in 16 essays written by senior Air Power Experts from across the Alliance, focusing on Joint Air Power at the Operational level of war and above and providing 88 key recommendations to NATO’s senior political and military leaders. The Future Vector of Joint Air Power in NATO was also the focus of the 2014 JAPCC Conference, which was held in Kleve, Germany in November. I think this was an outstanding Conference, featuring high-level debate and discussion on how the Alliance should posture its Air Power in coming years to ensure it is available to meet our collective security requirements. The Con­ference emphasized that, as we prepare for the future, NATO and its member nations must actively inves­tigate, develop and promulgate a shared vision for ­future Joint Air and Space Power. Some of the work to develop this vision is being undertaken today in NATO with the support of the JAPCC. Undoubtedly in this rapidly changing world the future is hard to predict, but it is safe to assume that the Alliance will continue to be required to execute Collective Defence, Crisis Management and Cooperative Security at variable levels of intensity. For decades NATO Joint Air and Space Power has provided the asymmetric advantage to the Alliance. NATO’s political and military decision-makers must continue to act collectively to preserve this advantage. We at the JAPCC stand ready to support this effort!